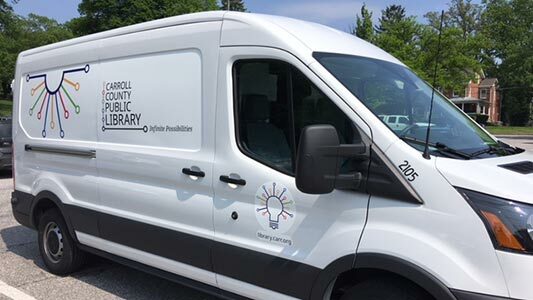 Carroll County Public Library provides service to Independent Senior communities, Assisted Living facilities, Long-term Care facilities, and Adult Medical Day Care facilities in Carroll County. Independent Senior communities are served by a bookmobile with a browsing collection of library materials. A librarian is available to assist in material selection, take hold requests, and answer questions. New books of all types are on shelves for browsing: fiction and non-fiction in both regular and large print, movies, magazines and recorded books on compact discs. Customers can use their existing Carroll County Public Library card or get a new one. The bookmobile returns three weeks later to pick up items that are due and open its doors for customers once again. The dependent senior facilities are served by a librarian and volunteers, who work with the Activities Directors and the patrons to create a revolving collection of materials for the facility to borrow to support the interests of the patrons at the facility. Please complete the Service to Seniors service request form to determine if your senior care agency is eligible for service. To find out if your senior community is eligible to receive services, contact Cindy Osborne, 410.386.4450 x7733 or Kathy Hlavin, 410.386.4450 x7732. Carroll County Public Library is pleased to share books, stories, puppets, songs and finger plays in your licensed home child care, child care center or preschool classrooms to encourage the love of books and reading and to support school readiness. Please complete Storytime Express Stop Request form to determine if your home based child care, child care center or preschool classroom is eligible for service. Outreach library services have expanded tremendously since 1958. In addition to service provided at its full-service branches, CCPL provides mobile service through Storytime Express Service to licensed home-based and community child care center and preschool classrooms. Services to Seniors reach out to older adults. A deposit collection is maintained at the Carroll County Detention Center. In addition, Outreach Services includes pop-up programs to county-wide events and festivals. Outreach services and programs are available as staff and resources allow. CCPL's Service to Seniors continues to provide service to skilled nursing facilities, assisted living homes, adult day care centers, and retirement communities.